Another amazing year of science has come and gone, so it’s time to look ahead and see what the next year has in store. Here are Gizmodo’s most anticipated scientific and technological developments of 2016. Comet Catalina as seen on December 6, 2015 by Brian D. Ottum in Rancho Hidalgo, New Mexico. Skywatchers will be greeted in the New Year by comet Catalina. Discovered back in 2013, the object, which is coming in from the Oort Cloud, will be making its closest approach to Earth on January 17, when it will be 0.72 AU (67,000,000 miles or 108,000,000 km) from Earth. At this distance, comet Catalina will appear at a magnitude 5.5, which means it’ll be visible to the naked eye. Mars will reach full opposition in May of 2016 (i.e. the planet will be almost directly opposite the Sun in the sky), so we’re fully expecting to hear some media outlets proclaim that it’ll be as big as the full moon. Just ignore them, because that’s not going to happen, nor will it ever. That said, 2016 will be an excellent year to study and launch missions to the Red Planet. 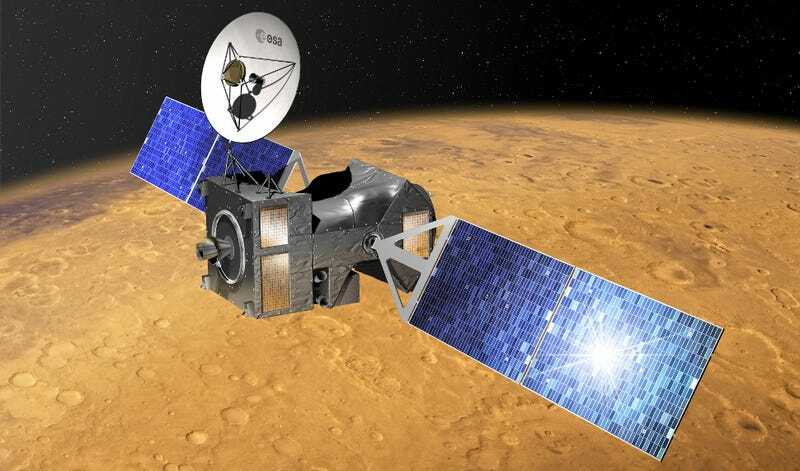 In March, the European Space Agency (ESA) and Russia’s Roscosmos will jointly launch the ExoMars Trace Gas Orbiter and Schiaparelli Mission on a proton rocket. By taking advantage of the positioning of Earth and Mars, the spacecraft will arrive at the Red Planet in just seven months. So starting in October, we can expect to see some early results. The Trace Gas Orbiter will search for signature gases in Mars’s atmosphere, while the Schiaparelli module will land on the surface to test critical technology for future missions. Also in March, NASA astronaut Scott Kelly, along with Russia’s Mikhail Korniyenko, will return to Earth after spending more than a year in space. Once back on Earth, scientists will closely study the pair to gain a better understanding of the effects of microgravity on the human body. And for the first time ever, they’ll be able to perform a comparative analysis on twins; Scott Kelly’s identical twin brother, Mark, remained on Earth as a “control” subject. Excitingly, the Pasadena-based Planetary Society will be sending its crowd-funded LightSail-1 cubesat into orbit. The $4.5 million spacecraft will carry large reflective sails measuring 344 square feet (32 square meters). These sails will use the Sun’s energy as a method of propulsion. Launch is scheduled for April. Should it prove successful, two more solar sails, dubbed LightSail-2 and LightSail-3, will be built. On the 4th of July, NASA’s Juno spacecraft will arrive at Jupiter. The spacecraft, which has been en route to the Jovian system for the past four years, will enter into a polar orbit to study Jupiter’s composition, gravity field, magnetic field, and polar magnetosphere. And in addition to studying how the gas giant formed, Juno will be scanning Jupiter’s vicious 384 mph (618 km/h) winds. And with the JunoCam on board, we can expect to see the most glorious images of Jupiter ever taken. September will be a particularly noteworthy month for space enthusiasts. On September 3, NASA will be launching OSIRIS-REx, a $800 million mission to retrieve a sample from asteroid Bennu. The spacecraft is expected to return to Earth with its chunks of rock in 2023. Analysis of this material will help scientists learn more about the origin of the Solar System. Also that month, the Rosetta spacecraft will end its mission by crashing—as gently as possible—into Comet 67P. The idea is to collect high-res surface images, and possibly even more scientific data, before the spacecraft finally falls silent. China’s Five-hundred-meter Aperture Spherical Telescope (FAST) will go online sometime in September, at which point it will be the largest radio telescope in the world. The massive dish will be used to explore the origins of the Universe—and even assist in the search for extraterrestrial intelligence (SETI). On November 1, Sierra Nevada Corporation plans to launch Dream Chaser, a privately-built reusable crewed suborbital spaceplane. The vehicle, which will launch vertically on an Atlas V rocket and land horizontally and automatically on a conventional runway, is designed to carry up to seven people to-and-from low Earth orbit. For its inaugural flight, the plane will not have a crew. Private Russian company Orbital Technologies is expected to launch a commercial space station that could serve double duty as a space hotel for tourists. We’ll believe it when we see it. And finally, China will be launching two space probes, including the world’s first quantum communications test satellite (scheduled to launch in June), and the Hard X-ray Modulation Telescope, which will look for energetic sources of radiation, including black holes and neutron stars. Like 2015, the coming year will likely yield tremendous advances in gene-editing technologies—and with them, ethical conundrums. First and foremost, scientists and bioethicists will continue to discuss the best way to move forward on regulating experiments involving potentially heritable gene-edits to the human germline. Earlier this month, the scientific community agreed that work in this area should proceed, but pregnancies are strictly forbidden. Broad safety and ethical guidelines should appear late in the year. And like the past year, expect to see even more advances made with CRISPR, a powerful, fast, and cheap gene-editing tool. The coming year will also bear witness to the arrival of bioengineered monkeys with human diseases. By using gene-editing technologies, researchers are planning to create “humanized” monkeys that exhibit common human diseases, including autism, schizophrenia, Alzheimer’s, and severe immune dysfunction. Given that medical experiments on apes are progressively being phased out in the US, the scientific community has its sights set on monkeys. But as we mentioned back in early 2014, the ethics of all this are dubious at best. Expect an uproar from animal rights activists. Human trials are also set to begin with gene-editing tools. California-based Sangamo Biosciences is planning to test enzymes to correct a gene defect that causes hemophilia. The study, which was just approved by the FDA, will be the first in vivo protein replacement platform for the treatment of Hemophilia B. The company, in cooperation with Biogen, will also begin trials to determine if a similar technique can be used to boost hemoglobin in people with the blood disorder, beta thalassaemia. Also, Axovant Sciences is expected to release results of a study looking into a compound — one previously tested on patients with dementia — that’s showing promise in treating people with Lewy body dementia, which causes visual hallucinations. The coming year may also see a resumption of “gain-of-function” studies on communicable diseases. Back in October 2014, financial support for U.S. researchers was withheld owing to safety concerns. In gain-of-function experiments, scientists engineer dangerous viruses to have new capacities, such as the ability to find a home in a new species. These experiments are meant to be a kind of pre-emptive strike against viruses before they naturally mutate into something dangerous to humans. Some experts fear that these lab-grown viruses could escape from the lab, prompting the temporary hold on this line of research. But as Nature News reports, a risk-benefit analysis was completed in December 2015, and the U.S. National Science Advisory Board is expected to issue recommendations in the coming months on whether funding should resume, and whether there should be tightened restrictions on research. IBM’s Watson will also be making news in 2016, but not for dominating at Jeopardy. The expert number cruncher and natural language processor will be sifting through massive piles of data to find useful and cost-effective solutions for medical researchers, doctors, and insurers. It’s part of IBM’s recently launched Watson Health Unit. In July, Elon Musk will be holding an open competition to test out different Hyperloop designs. The basic principle behind this futuristic mode of transportation involves pressurized passenger capsules that zoom through low-pressure tubes on a cushion of air, which are accelerated by a series of magnets. The contest, which will see contributions from independent engineers and students, will take place on a 1.2 mile (2 km) test track near SpaceX’s base in Hawthorne, California. 2016 could also see a new land speed record. On October 15, the Bloodhound supersonic car will attempt to smash the existing mark of 763 mph (1,227 km/h) to over 800 mph (1,287 km/h). Meaningful data from the Laser Interferometer Gravitational-Wave Observatory (LIGO) could start to come in, and possibly include the first evidence of gravitational waves. These waves were first predicted by Einstein’s general theory of relativity in 1916. LIGO recently underwent an upgrade, which is cause for the optimism. And on June 21, scientists will inaugurate the MAX IV synchrotron in Lund, Sweden. Physicists at the Max-lab will operate three accelerators for synchrotron radiation research. Earth scientists will be keeping a close watch on El Niño, which will continue to be a disruptive meteorological force in 2016. There’s an 80-percent chance that it’ll last into spring, bringing warmer waters, increased precipitation, flooding, and generally wacky weather to most parts of the world. NASA Earth Observatory map by Jesse Allen, using Jason-2 and TOPEX/Posideon data provided by Akiko Kayashi and Bill Patzert, NASA/JPL Ocean Surface Topography Team. A working group will convene in 2016 to discuss whether the current epoch should be formally recognized as the Anthropocene. Organized by Leicester University’s Jan Zalasiewicz, the group will study the ways in which our species has reshaped the planet, and how we’ve essentially become a force of nature. If approved, the Anthropocene would be recognized alongside other epochs, such as the Pleistocene and Holocene. It appears that 2015 will be the hottest year on record, so climate scientists will be eager to learn where 2016 will stand in the larger scheme of things. In December, a forecast issued by the UK Met Office predicted that 2016 will in fact be the hottest year on record globally. Finally, Swiss firm Climeworks is scheduled to launch its carbon capture start-up sometime in July. It’s reportedly the world’s first commercial-scale atmospheric carbon capture plant. According to the company, the plant will capture 900 tons of carbon dioxide from the atmosphere each year.